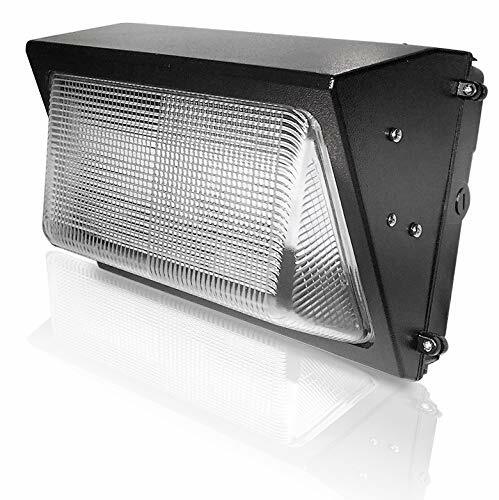 Replace your old wall pack with our newest 2016 high efficiency LED wall packs. Save money and never have to replace bulbs with a 100,000 hour rated LED. Fixture is also ideal for new installations. 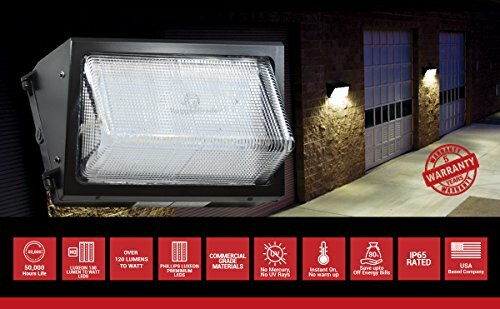 Light up an area of your house or building for safety and aesthetics. With Lumen ranges from 1,000-14,000 we have what you need to light up your building! RuggedGrade was formed to bring higher quality LED lighting to the public. There is so much great new technology in LEDs, but unfortunately there is so much confusion and poor quality products in the marketplace. We are committed to only the highest quality and best technology in LEDs. BETTER DESIGN - DLC came back at 119.7 Lumens to watts! Even better than expected! New Phillips Luxeon SMD 3030 LED modules 120 Lumens per watt - Save even more by using a lower watt unit. Compare the lumens against others. 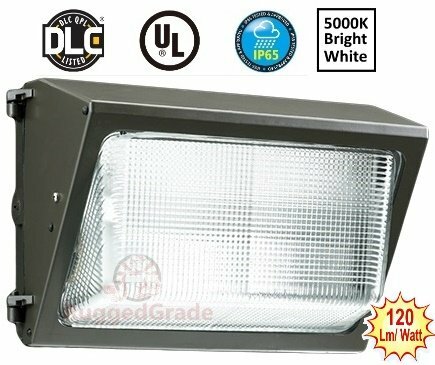 Premium grade components make this an industrial grade LED Wall Pack Light BRIGHT LIGHT - The 60 watt is rates at 7,232 by DLC. 7,232 Lumens can replace a 400-500W HPS/HID/HALIDE light. 5000K light color ensures a bright clear light. Over 100 degree angle creates a wide light distribution. 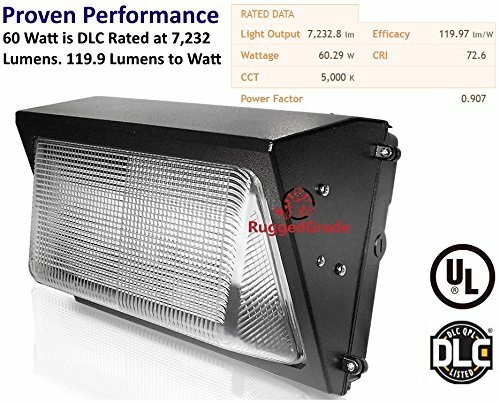 BUILT TO LAST - 100,000 LED saves having to replace bulbs- Aluminum Housing with high tech Heat Sink. Better Heat dissipation ensures longer LED life and safety. 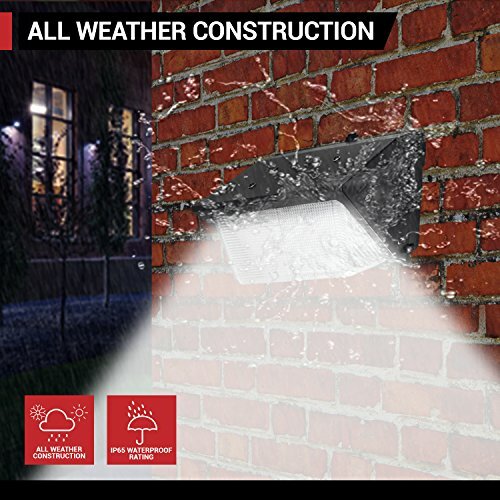 IP65 Waterproof for all weather conditions. All backed by a 5 year warranty. EASY INSTALLATON & OPTIONAL PHOTOCELL. Unit has 3 conduit entrance locations and a standard circle cutoff in the rear for easy installation. Whether you are retrofitting an old unit or doing new construction, these are easy to use. Dusk to Dawn sensors (Photocells) can be added but are not required. CERTIFIED - UL Listed and DLC verified for safety and rebate eligibility. UL Certified products ensure better quality, safety and reliability. DLC is the Design Lights Consortium for independent verification of performance.